An Easy method to export NSF file to PST format or Lotus Notes to Outlook will help you to transfer IBM notes data to outlook data in few clicks. NSF file stands for Notes Storage Format and PST stands for Personal Storage Table File. NSF works with Lotus Notes and PST works with MS Outlook. Lotus Notes is developed by IBM and outlook is developed by Microsoft. Both of them are different platforms so NSF file can’t directly operate from Outlook. IBM Lotus Notes is the most using suit in the IT industry. Now there is a query occur why there is a need for conversion and How to Export NSF file to PST format. Initially, if you are using Lotus Notes and now you are switching in Outlook then it is difficult to use any NSF data in Outlook’s server because Outlook or Lotus Notes doesn’t provide any utility to do any conversion or migration. Why is NSF to PST Conversion compulsory? Now, these days’ lots of users are switching from Lotus Notes to Outlook and searching about best and professional solution for the NSF to PST Converter Tool. The biggest reason for this is NSF save their mailbox data in a different format with NoSQL technology so this data can’t be accessible on other platform or server. NSF file can’t be open in Outlook directly. NSF works on different client-server than Outlook. A user can operate more than one account from Outlook but can’t from Lotus Notes. MS Outlook is cost-effective as compared to Lotus Notes. Outlook provides a user-friendly interface as compare to Lotus Notes. The updates of Outlook are easy to get as compare to Lotus Notes. The maintenance cost is Lotus Notes is higher than Outlook. Job Switching may be the reason for conversion. The data maintenance of Outlook is easy and better than Lotus Notes. The Data security structure of Lotus Notes is complex to understand. For e-mails, search Outlook is more reliable as compared to Lotus Notes. How to do a Conversion of NSF to PST? As we know Outlook and Lotus Notes doesn’t provide any utility for conversion so the user can do it manually or by using third party tool. 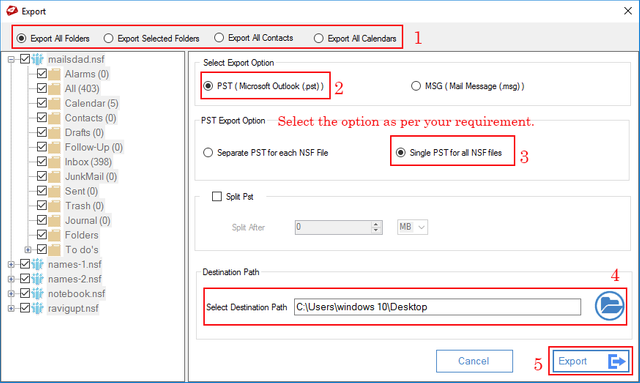 A user can migrate NSF data in Outlook PST in two ways. 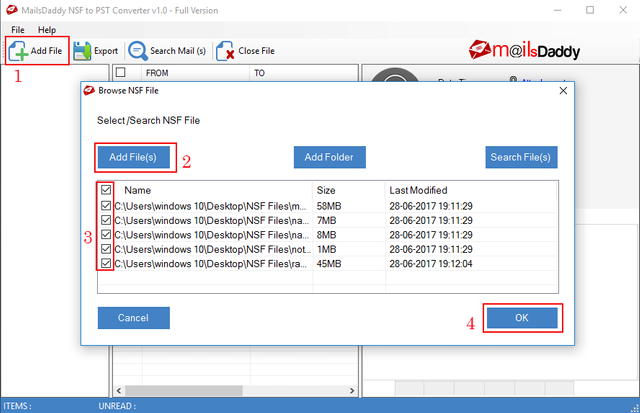 Export NSF to .csv format. Import CSV in Outlook PST. Here are some steps listed below. Open NSF file in Lotus Notes Program. Open the mailbox and click on file menu click on Export. From the next dialog box select, the Comma Separated Value and assign a name to the file. Select the options as per your need. The data will save at given saving location after the export process has been completed. Open MS Outlook and click on File Menu. Click on open and export and select the Import/Export option. From the opened dialog box select the Export from another program or file option. Select Comma Separated Value and click on next. Click on Browse button to select a CSV file and select an option from the options block then click on next. Provide a saving location to the file and click on next. From the next opened dialog box check the checkbox and click on finish. When a user migrates Lotus Notes NSF file data in Outlook PST using manual method then there are more chances to do mistakes and result will be very harmful. The user can lose their NSF file data or the file may be corrupt. The manual method is a very time-consuming, lengthy and the user must be technically strong for the migration process. Both the platform should be installed in the machine for the manual process. In the other hand when we use a third party tool then the migration becomes very simple and time-saving. 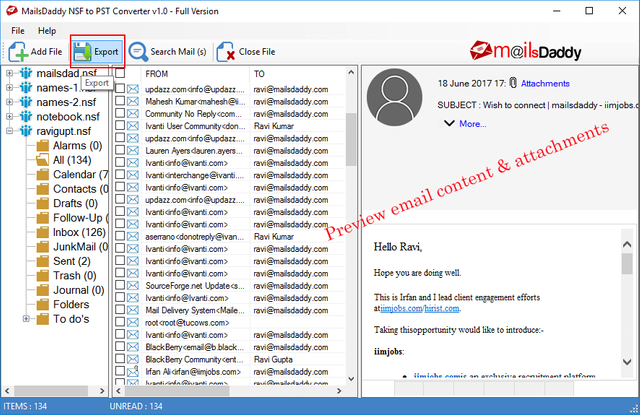 Using free tool has some properties like there is no need to install Outlook in the machine and it provides some facilities for the migration process, a user can save their file in MSG or PST format as per their requirement. Third party software MailsDaddy NSF to PST Converter is the best for conversion of Notes data to Outlook data. Using this tool user can split their exported PST file according to the size requirement. The data structure of PST file will be the same as in the NSF file before the exportation. 2. Click on Add files. 3. Select any NSF file which you want to migrate. 5. Select the options from each section from the opened dialog box as you need. 6. Click on Export button to start the export process. 7. Check the process from the process bar after completion of the process you are able to access the NSF file data in the form of PST. In the article, I discussed the causes responsible for the process and explained How to Export NSF file to PST format. As I described the manual process which is very lengthy so it may not be suitable for a bulk data exportation in this case you should use third party tool which can do the bulk migration very easily and fast. Here I talked about all the process in very simple words but if you have any suggestion related to the process please give your good comment in the comment box and if you have a query then contact to developer’s support team. ✅ @ravigupta, I gave you an upvote on your post! Please give me a follow and I will give you a follow in return and possible future votes! Congratulations @ravigupta! You received a personal award!